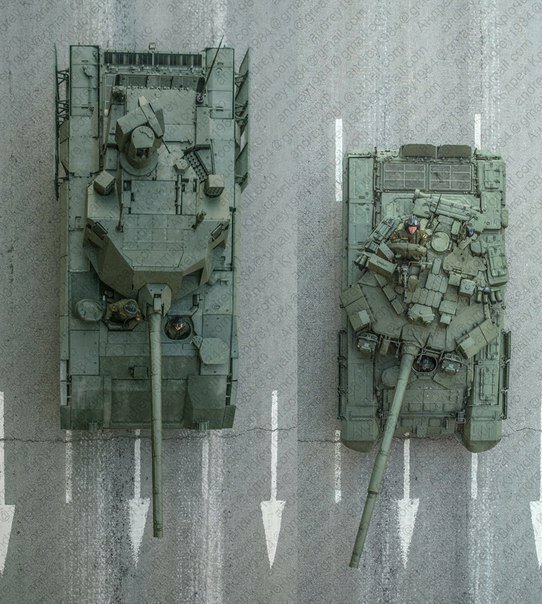 Considering that T-90MS and T-14 are reported to weight about the same (48 metric tons) T-14 with its larger surface area will almost certainly have a lot weaker armor protection - material advances are very unlikely to compensate for such increase of surface area. Ya know what? I never considered it but he's right! I always thought that the T-14 was much heavier than the T-90 (actually I thought it was in the same weight class as the M1A2C...about 70 tons). Taking this into consideration we have to rethink our drink when it comes to this vehicle. Crew survivability might be improved (that almost goes without doubt), but I am willing to bet that getting mission kills will be much easier. Considering the volume then we can bet that most of the armor is dedicated to protecting the crew. That means that the main gun, engine and probably the rear half of the vehicle is vulnerable. Maybe not to machine gun fire but it will probably be penetrated by certain 25mm rounds and definitely 30mm and higher. Additionally anti-tank missiles might need to be coordinated because of the APS system it has but artillery fire should be able to at least get mobility kills because of the almost certain lack of armoring on the engine deck. Of course it does raise a disturbing possibility. Why would the Russians go so big on this vehicle when they have extensive experience with autoloading tank guns? Certainly they could have made a more compact package couldn't they? My guess? I'm thinking that it's about what we talked about yesterday. They're working on a bigger gun to mount on this beast. What we're seeing today is simply a stand in for future development. This isn't the final form I think.